Star Roses and Plants introduced three new color additions to its Knock Out family of roses: the White Knock Out Rose, the Coral Knock Out Rose and the Peachy Knock Out Rose. White Knock Out blooms from spring through fall, maintains a compact habit and has a very slight citrusy fragrance. Coral Knock Out offers a new color addition to the Knock Out family of roses. According to the company, the coral color is stronger in hot, humid climates. It blooms from spring to fall and maintains an upright to rounded habit. Young foliage is bronze red. Peachy Knock Out blooms from spring through fall with pink flowers. The overall color effect is peach with the combination of pink petals that become yellow in the center. The color will be more intense with the cooler temperatures in the spring and fall, the company said. The color can fade to blush with the onset of heat and humidity. Coral Knock Out will be available in southern states and some Midwest states, while Peachy Knock Out will only be available in the Northeast region to Illinois and Minnesota. 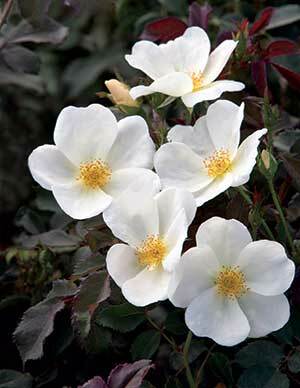 The White Knock Out Rose will be available for sale throughout the country. White Knock Out, Coral Knock Out and Peachy Knock Out are available now to growers.